Hypothyroidism is the most common form of thyroid malfunctions, affecting up to 15 percent of Americans in cases ranging from mild to those requiring medication, according to the American Thyroid Association® (ATA). The diagnoses have been climbing because technology has enabled lab tests to recognize milder conditions that weren’t recognized previously, says Dr. Elizabeth Pearce, associate professor of medicine at the Boston University School of Medicine and the president-elect of the ATA. 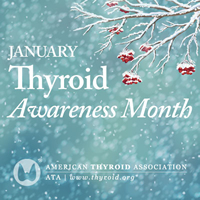 January has been designated thyroid awareness month by the ATA®.